Includes vSphere Desktop, Horizon View Manager, View Composer, Persona Management, ThinApp (Packager, Client, Workstation), and vCenter Desktop licensed for 10 concurrent connections. Includes vSphere Desktop, Horizon View Manager, View Composer, Persona Management, ThinApp (Packager, Client, Workstation), and vCenter Desktop licensed for 100 concurrent connections. 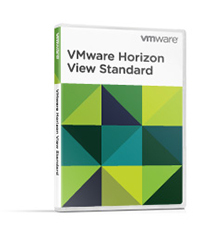 VMware Horizon Standard provides simple powerful VDI with great user experience. Centralized virtual desktop managementgoverned by business policies. Blast Experience to deliver consistent user experience different devices and locations. Application packaging with VMware ThinApp. Optimized for the Software Defined Datacenter with vSphere Desktop, vCenter Desktop. Lower total cost of ownership of existing Windows PCs and applications. VMware Horizon 7 is the leading platform for virtual desktops and applications. Provide end users access to all of their virtual desktops, applications, and online services through a single digital workspace. Today, end users are leveraging new types of devices for work—accessing Windows and Linux applications alongside iOS or Android applications—and are more mobile than ever. In this new mobile cloud world, managing and delivering services to end users with traditional PC-centric tools have become increasingly dicult. Data loss and image drift are real security and compliance concerns. And organizations are struggling to contain costs. Horizon 7 provides IT with a new streamlined approach to deliver, protect, and manage Windows and Linux desktops and applications while containing costs and ensuring that end users can work anytime, anywhere, on any device. Horizon 7 enables IT to centrally manage images to streamline management, reduce costs, and maintain compliance. With Horizon 7, virtualized or hosted desktops and applications can be delivered through a single platform to end users. These desktop and application services—including RDS hosted apps, packaged apps with ThinApp, SaaS apps, and even virtualized apps from Citrix—can all be accessed from one unified workspace to provide end users with all of the resources they want, at the speed they expect, with the eciency business demands. Horizon 7 is tightly integrated with VMware’s Software-Defined Data Center, which includes vSphere, vSAN and NSX. This integration provides a seamless turnkey solution, eliminating the need to build, test and support disparate storage, virtualization and networking products. With VMware vSAN, customers can drive down the cost of getting started and take advantage of a number of pre-configured appliances optimized for Horizon including vSAN-ready node appliances, EVO SDDC infrastructure. Get up and running quickly with our hyperconverged infrastructure solution – a tightly integrated software stack ideal for Horizon desktop and application virtualization. vSphere Desktop is a new edition of vSphere for deploying desktop virtualization. It provides the full range of features and functionalities of the vSphere Enterprise Plus edition allowing you to achieve scalability, high availability and optimal performance for all of your desktop workloads. VMware vRealize Operations for Horizon is a monitoring and reporting tool to manage your Horizon and XenDesktop/XenApp environments. VMware NSX for Horizon brings speed and simplicity to virtual desktop infrastructure (VDI) networking, with policies that dynamically follow virtual desktops. Scale and secure your Horizon deployment with push-button simplicity and realize value faster.VMware Cloud Foundation for Horizon delivers an enterprise cloud platform with integrated virtual desktop and application services. 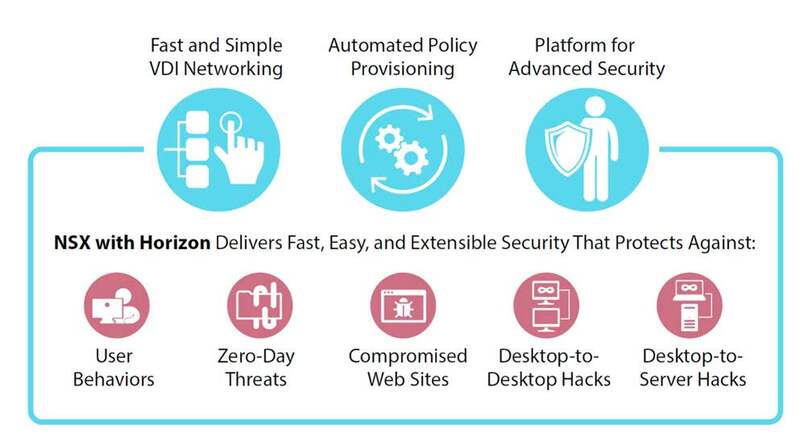 VMware Horizon 7 on VMware Cloud on AWS delivers a seamlessly integrated hybrid cloud for virtual desktops and applications. Quickly deliver Windows and Linux resources at scale across multiple data centers. Simplify authentication across all desktop and app services with True SSO and contextual, granular, role-based policies that connect user, device and location information. Deliver multilayered protection of virtual infrastructure with simplified networking, automated intelligence and threat protection that goes from data center to device. Provide end users with easy access to virtual desktops and published applications—including RDS hosted applications and Citrix XenApp—through a single digital workspace. VMware Mirage provides next-generation desktop image management for physical desktops and POS devices across distributed environments. Simplify OS migrations and effectively isolate apps to prevent compatibility issues across Windows platforms with ThinApp. Deliver an immersive, feature-rich user experience for end users, across devices, locations, media and network connections with Blast Performance. Bring secure, workstation-class performance and rich 2D and 3D graphics from the cloud to remote and mobile workers with Horizon with Blast 3D. Rapidly deploy full-featured, personalized digital workspaces leveraging JMP technologies, which include Instant Clones, App Volumes and User Environment Management. Easily monitor performance, set up alerts and remediate issues to improve the user experience. VMware App Volumes provides radically faster application delivery with unified application and user management while reducing IT costs by up to 70%. User Environment Manager simplifies end-user profile management by providing organizations with a single, lightweight and scalable solution that leverages existing infrastructure. Deliver virtual or hosted desktops and applications through a single platform to streamline management, easily entitle end users, and quickly deliver desktops and applications to end users across devices and locations. Horizon 7 provides a single platform for delivering hosted Windows applications and shared desktop sessions from Windows Server instances using Microsoft Remote Desktop Services (RDS), virtual desktops, and ThinApp packaged applications. Horizon 7 supports both Windows as well as Linux-based desktops including RHEL, Ubuntu, CentOS and NeoKylin. With Horizon 7, IT can support real-time validation, streamlined identity management across identity sources like active directory and LDAP, and provide end users with contextual and customizable access to resources through a single unified workspace. Horizon 7 supports 2-factor, smart card and biometric authentication. It is designed and certified to meet the most demanding compliance regulations including those of the US Federal Government. Instant Clone Technology coupled with App Volumes dramatically reduces infrastructure requirements while enhancing security. Now you can deliver brand new personalized desktop and application services instantly to end users every time they log in. Deliver pristine high-performance personalized desktops to end users every time they log in. Reduce end point security concerns by destroying desktops as soon as users log off. Drastically lower costs by pooling required infrastructure and drive down storage costs by up to 30% with a truly stateless desktop, but delivered with the personalization they expect. With updated Cloud Pod Architecture, scale to over 50,000 desktops across 50+ sites with improved failover characteristics, in a fraction of the time of traditional desktop virtualization models. Horizon 7 provides end users with a consistently great experience across devices, locations, media and connections. Support more use cases across your organization with feature-rich capabilities and “Blast Performance” that will ensure your end users can be as productive as possible at all times. Blast Unity Touch – Intuitive and contextual user experience across devices, making it easy to run Windows on mobile. Blast Local Access – Access to local devices, drives. USB, and device peripherals. 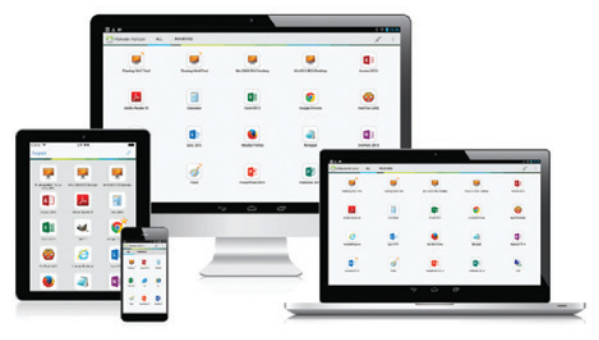 Horizon Clients with Blast – Unified client for consistently great experience across devices and locations. Blast Adaptive UX – Optimized access across the WAN and LAN through an HTML browser or the Horizon client using either PCoIP or Blast Extreme display protocols. Blast Extreme is purpose-built and optimized for the mobile cloud, built on industry-standard H.264 protocol. Blast Multimedia – High-performance multimedia streaming for rich user experience. Blast Live Communications – Fully optimized unified communications and real-time audio-video (RTAV) support. Horizon 7 now includes support for Microsoft Lync with Windows 10. Improve end user satisfaction by simplifying authentication across all desktop and application services while improving security with smarter, contextual, role-based policies. Support contextual, role based security for end users that maps policies based on user, device or location with ease. True SSO delivers one-click, password-free access to Windows desktop services. Streamline identity management across identity sources and provide end users with easy access to resources through a single unified workspace. Horizon 7 ensures that IT can consolidate control, automate delivery, and protect user compute resources through a single, tightly integrated platform. 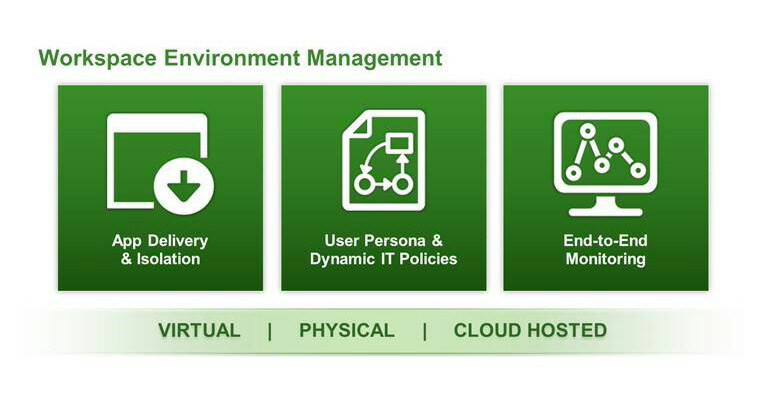 VMware User Environment Manager™ offers personalization and dynamic policy configuration across any virtual, physical and cloud based environment. Simplify end-user profile management by providing organizations with a single and scalable solution that leverages existing infrastructure. Provide end users with quick access to a Windows workspace and applications, with a personalized and consistent experience across devices and locations. Easily package applications to avoid compatibility issues. Instantly provision applications at scale. Dynamically attach applications to users, groups or devices, even when users are logged onto their desktop. Provision, deliver, update, and retire applications in real time. 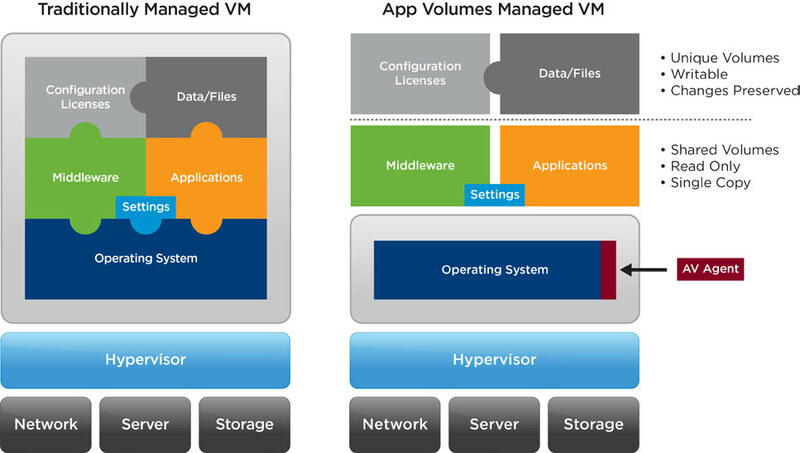 An App Volumes Managed VM is virtualized above the OS. Applications, Data Files, Settings, Middleware, and Configuration Licenses act as separate layers. Support desktop and application provisioning through Horizon. Support VMware Mirage for streamlined image management across virtual datacenters of physical and full clone virtual machines. Cloud analytics with VMware vRealize Operations for Desktops and Applications provides comprehensive visibility across VMware Horizon and Citrix XenApp and XenDesktop environments, allowing IT to optimize the health and performance of desktop and application services. Leverage and extend your expertise with vSphere to simply deliver desktop and application workloads. Horizon 7 extends the power of virtualization with virtual compute, virtual storage, and virtual networking and security to drive down costs, enhance the user experience, and deliver greater business agility. Horizon 7 includes support for VMware Virtual SAN™ with all-flash. Virtual SAN automates storage provisioning and leverages direct-attached storage resources to drive down storage costs for desktop workloads. Customers can leverage Virtual SAN Ready Nodes and other hyperconverged infrastructure appliances to support easy, scalable, and costoptimized desktop and application virtualization deployments. From a networking and security standpoint, Horizon with NSX (sold separately) further enables you to quickly and simply set up networking security policy for end users that stays with them across devices and locations regardless of any changes in the underlying physical infrastructure. Download the VMware Horizon 7 Datasheet (PDF).